It has been established for some time that our agricultural topsoil is depleted and lacking the full complement of minerals that should be there. Large industrial monoculture farming  practices that include no fallow time  or alternating crops with the extensive use of herbicides and pesticides are rightly blamed for this lack of minerals. This mineral deficiency is no light matter. It affects the crop foods we eat. Without minerals, vitamins are dysfunctional, and metabolizing them is hampered. Almost everyone is magnesium deficient, for example, and magnesium is involved with over 300 cellular metabolic functions. Some say more. Even organic farmers often have to overcome topsoil deficits initially. Some organically oriented farmers do over time, but it’s safe to assume that other large scale farms don’t or don’t bother much. After all, USDA organic certification depends on how crops are grown, not necessarily on the quality of its soil. Trace minerals are also vital for our health, yet they are mostly ignored and considered insignificant by many medical practitioners and mainstream nutritionists. Relying on supplements for enhancing one’s bodily mineral content has its drawbacks. One doesn’t know the purity of supplemental contents and their other ingredients. How well they’re digested and assimilated is also an issue. Is there another way to enhance mineral intake naturally? There are two syrups considered sweeteners that are actually loaded with minerals because the roots of their plant sources extend well below topsoil levels. One of those sweeteners is undiluted maple syrup tapped from maple trees. Maple syrup is actually very sweet and useful as a sweetener while supplying more minerals than most foods. A study on maple syrup’s health benefits was covered by Health Impact earlier. You can view that article here . The other sweetener, which this article will focus on, is not so sweet and tasty. As a matter of fact, its flavor is so strong and unusual that it almost obliterates the taste of what one is sweetening, though it can be incorporated in some recipes for cooking and baking. It is produced and bottled as unsulfured blackstrap molasses. It is very high in minerals. Of course it’s best to stick with organic unsulfured blackstrap molasses only. Some product labels read unsulphered with a “ph” instead of the “f.” They’re both the same compound that is part of the processing and not the sugar cane originally. So it’s not a healthy item for most. Ironically, molasses is the byproduct or “waste” from processing organic sugar cane or sucrose for refined table sugar. Refined table sugar creates blood sugar and insulin instability while providing almost no nutrients. Actually, refined sugar will pull nutrients, especially minerals, out of the body if consumed enough. But just like maple trees that provide maple syrup, the roots of cane sugar are deeper than one would think. They extend from 15 to 20 feet down, well past topsoil levels, measuring as much or more than the sugar cane grows in height. The process of isolating sucrose for table sugar involves first pressing the juice from the sugar cane, then boiling it and extracting sucrose crystals with centrifugal machinery. Molasses is the byproduct or “waste” from processing sugar cane or beet into table sugar. There are three levels of molasses according to which phase of extracting sucrose produces it: Sulfured, unsulfured, and blackstrap. Sulfur is used to process unripe green sugar cane. This version of sulfur is not so good for everyone. Sun ripened sugar cane is processed without using sulfur. So unsulfered molasses is a better choice. 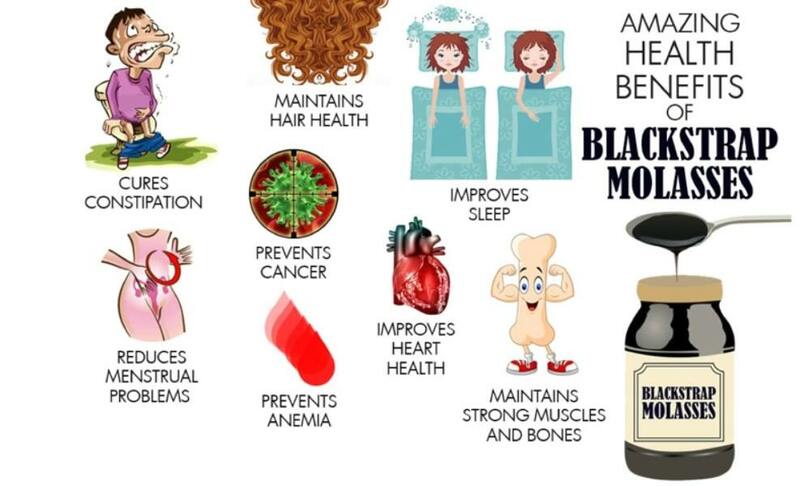 The third boiling necessary to extract table sugar from organic sugar cane sugar produces an extremely thick dark substance known as blackstrap molasses, which is the most nutrient dense of all. So that’s what to look for, organic unsulfured (or unsulphured) blackstrap molasses, which will be referred to as molasses throughout the rest of this article. It’s fitting that molasses can be used to restore soil’s natural health in gardens and small scale farming. This reporter embraces unprocessed undiluted maple syrup as a very healthy mineral rich sweetener whenever appropriate, but uses not so tasty molasses as a daily tonic to compensate for dietary mineral deficiencies, a tablespoon or two daily with a small water chaser. Others prefer to mix it in warm water. Molasses has a low glycemic index rating. It won’t spike your blood sugar as much as sugar or other sweeteners do. It also contains a significant amount of chromium, a trace mineral known to help improve cellular uptake of insulin by reducing insulin resistance, the main characteristic of diabetes 2. Another trace mineral high in molasses is selenium, which is a valuable anticancer compound. Selenium has also been part of holistic approaches for handling liver infections and inflammation, including hepatitis C. There is a toxicity limit to dosing with selenium supplements that one can ignore if using food as a selenium source. Manganese, also a trace mineral, is strongly present in unsulfured blackstrap molasses. Manganese functions with a number of enzymes that are essential to combating unusual free radicals. Like magnesium, manganese also supports cellular absorption of nutrients, and is also beneficial to the nervous system. The trace mineral zinc that is also contained in molasses is an important asset for the immune system. It also helps maintain prostate health. But it’s not just micro-nutrient trace minerals that molasses possesses, there are important macro-minerals also. Molasses is high in potassium, without which heart health issues and even death from heart failure can occur. Potassium loss can occur from excessive sweating, urination, and extreme diarrhea if there is not enough coming in through food. The medical term for low body potassium levels is hypokalemia . It is a dangerous condition that should be avoided. The “master mineral” magnesium, which is involved with over 300 cellular metabolic processes, some vital for heart health. It also assists absorption of calcium into bone matter, which molasses also abundantly contains. 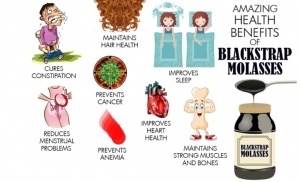 Many have used molasses successfully to resolve anemia issues because it is high in iron. Cautionary caveat: Ensure anemia is from iron deficiency and not from another cause. Too much dietary iron accumulation may lead to hemochromatosis, which increases the risk of arthritis, cancer, liver problems, diabetes and heart failure. Using maple syrup as a sweetener to replace sugar is very wise. It’s neuroprotective benefits will help avoid “sugar blues” as well as children’s hyper-activity and lack of focus. Though not a tasty “sweetener,” the synergistic blend of trace and macro-minerals makes molasses an excellent daily food supplement for the minerals that are lacking in our food from depleted topsoil.